The spent caustic soda solution can be stored in big tank and disposed of by sending periodically the spent solution to specialized and authorized companies. In alternative it is possible to recover the caustic soda by mean of a plant named Crystalfix. 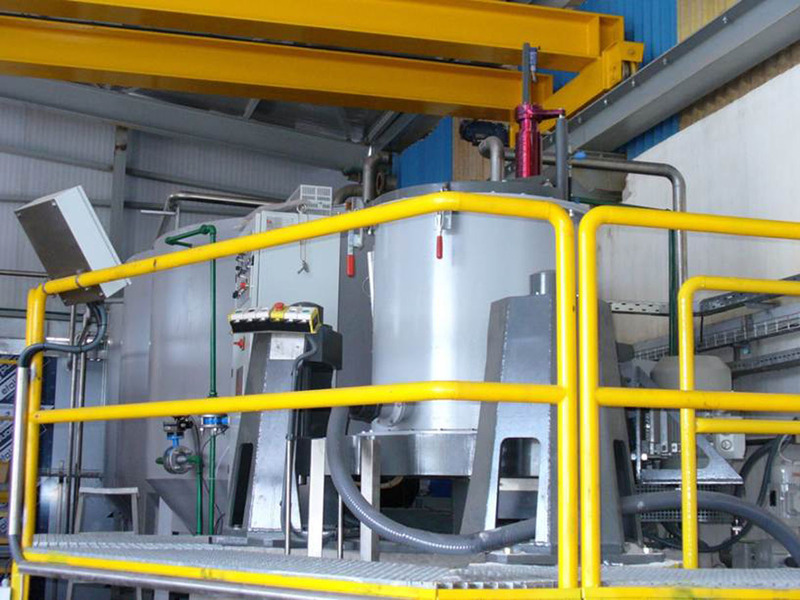 The plant for caustic soda recovery is a valid alternative to the disposal of the dies treatment liquid and it has been developed by Italtecno to conform to the different aluminium extrusion lines. The advantages that it presents compared to the traditional systems are practical and ecological. Crystalfix uses a chemical reaction to transform the spent caustic soda in fresh, re-usable soda. The economical advantages that are obtained with this technology are clear: the consumption of soda is almost null and the quantity of spent soda that must be disposed of, as a toxic and hazardous material, is drastically reduced. The system works as a closed circuit: there is no caustic soda consumption (except the caustic soda lost in drag-out and rinsing), the same quantity of aluminium extracted by the plant is recovered as aluminium hydroxide tri-hydrate. The obtained precipitate may be sold for particular applications or disposed of as normal waste. Another advantage of this automatic process is that the concentration of caustic soda remains constant therefore there is always a high cleaning efficiency. As a matter of fact, by working in the traditional way, after a few cleaning cycles, the chemical attack decreases noticeably because of the aluminium dissolved in the pickling tank. Consequently the solution must be frequently changed with big economical losses. The process management is simplified because the plant works automatically and continuously and it eliminates the problem of the frequent regeneration of the pickling solution. Another important advantage is the one related to the safety of the environment. Operating with a closed circuit, without the production of polluting substances that must be disposed of, improves the quality of the surrounding environment. The conditions (chemical and physical) for the precipitation of aluminium hydroxide and the recovery of caustic soda solution are very particular and they make part of a process developed by Italtecno with a patent pending.